Please join us and our families (kids welcome!) 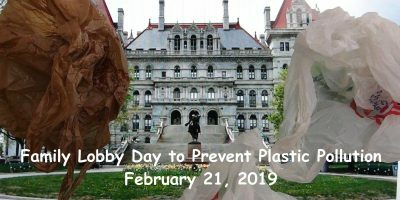 when we meet with NY state representatives to support legislation banning single-use plastic carryout bags, Senate Bill S95. Where/When: Thursday, February 21 at 9:30 a.m. at West Capitol Park, just across the street from the Legislative Office Building (198 State Street). We will then meet with lawmakers and staff at the Capitol building and Legislative Office Building. If you can only come later, go ahead and stop in to see your legislators! Families from outside the Albany area are encouraged to contact their Senators and Assemblymembers, too! Non-Albany area legislators will likely not be in Albany that day, as the legislature is not scheduled to be in session. What: Tell our representatives to protect our environment from plastic bag pollution by (1) signing on as sponsors of the bill, (2) working for the bill’s passage, and (3) issuing public statements in support. Afterwards, we will follow up with our representatives to make sure they heard our voice! Let’s help educate our kids about good governance and democratic action and show them that we can solve environmental problems together! The legislation would ban plastic carryout bags and place a ten-cent fee on all other carryout bags, to encourage the use of reusable alternatives. Revenue raised by the fee would go to the State Environmental Protection Fund. Yes! Similar bills have been effective throughout the U.S. and world wide in reducing plastic bag use and encouraging a switch to reusable bags. For example, Los Angeles County has had a ban/fee hybrid in place since 2012, which resulted in a 94% reduction in carryout bag use. This model has been adopted statewide in California since 2016 and in a growing number of New York municipalities and counties. Will the bill hurt low-income citizens? No — Customers paying with SNAP or WIC are exempt from the fee. Stores will keep 20% of the fee to defray costs, with the remaining 80% going to the state Environmental Protection Fund, for use by localities for pollution reduction, cleanup, and education, and reusable bag distribution, with priority given to low- and fixed-income communities. I don’t live in the Albany area, so how can I contact my Senator or Assemblyperson? Yourself, friends, family, kids, snacks, and signs or posters if you would like.